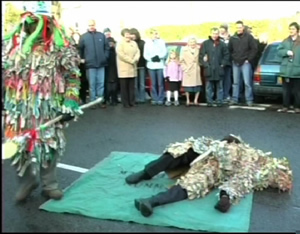 A film by Peter and Beryl Kennedy portrays the annual "Mummers" at Marshfield, Gloucestershire, near Bath, Chippenham and Bristol. On a beautiful crisp Boxing Day morning in December 2004, with snow still lying on the ground, the mummers are completely covered in a disguise made of strips of newspaper, some of their costumes dating back 75 years. The sight of this group of mummers, led by the bellringing Town Crier and Father Christmas, performing outside the pubs and almshouses along the single street of mainly listed buildings is an annual highlight, not only for locals but for the thousands of visitors who come to see them. This film gives the full background of how the custom was revived; how the vicar, after hearing his gardener mumbling some of the words of the play, consulted his sister, the folklorist, Violet Alford, who immediately recognised its importance (Colour 2004/ 59mins)- Hear them (dating from 1947) on CD FTX-104. 6. Band plays "The Coventry Carol"